Chelsea Haircut | Photos, Styling Tips & More! 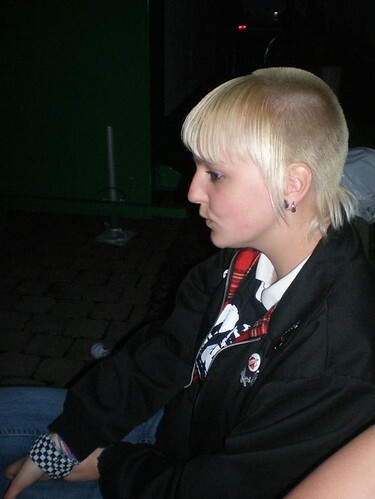 The Chelsea haircut is often worn by women involved in the punk scene. The close-cropped hair adheres to the edgy punk vibe, but the longer bangs and longer pieces of hair on the side that are sometimes included in the cut allow the wearer to retain her femininity. As you can see from the pictures it can be worn short, medium or long. As with all haircuts, the Chelsea haircut works better on some face shapes than on others (to find out your face shape click here.) No matter her face shape, just about any woman can wear a Chelsea haircut with a few variations. Women with curly hair have difficulty pulling off this style; it works best with straight or straightened hair. Women with long faces look good in bangs, so this cut can work for them. Women with square faces should keep the side pieces in this cut at about their jawline. Women with round faces should let the side pieces grow a couple of inches below the jawbone. To create this look, a stylist will clip the front section of the hair out of the way and use clippers to cut the rest of the hair to a little less than an inch long. After the hair on the back of the head is trimmed close to the scalp, the rest of the hair is let loose. The stylist will cut bangs from the hair left long, and trim the side pieces to the wearer’s specified length. This cut is very easy to style. The closely cropped hair in the back requires nothing more than a quick shampoo. The hair in the front can be combed and left to air dry. If the wearer has curly or wavy hair, the front pieces can be smoothed with a flat iron. This edgy cut is cool in the summer and fun to wear. To add an especially interesting element to the style, dye the hair a bright color.